Spruce up your deck or patio flooring using perforated interlocking floor tiles. 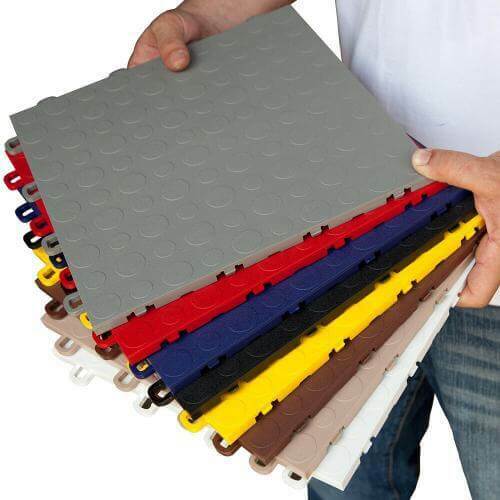 These interlocking tiles are available in various colors. The perforated or mesh design allows maximum water flow. The tiles are made in the USA and are easy to install. Renovate any concrete patio floor or wooden deck floor with our perforated interlocking floor tiles made in the USA. With the dual grid perforated (drain) design, the tiles tend to look two-toned when viewed at an angle. These patio floor tiles are 12 x 12 x ½ inch and allow water or other liquids to drain easily. 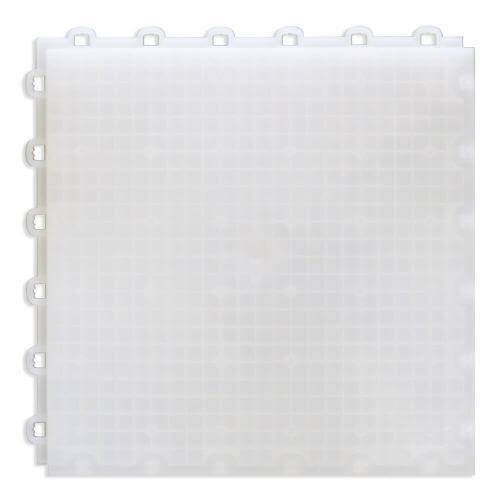 BlockTile perforated tiles are made out of a specially formulated high-impact polypropylene (high-impact plastic) capable of supporting heavy loads. It is a rigid product, but it will conform to a slightly uneven surface. The tiles can support the weight of your patio furniture. The mesh design allows full air and water flow. We designed them to be used on your patio flooring or deck flooring, so they come with UV protection for use in direct or partial sunlight. The tiles are also commonly used in residential garages. In addition, they have a non-slip surface design as seen in the pictures. 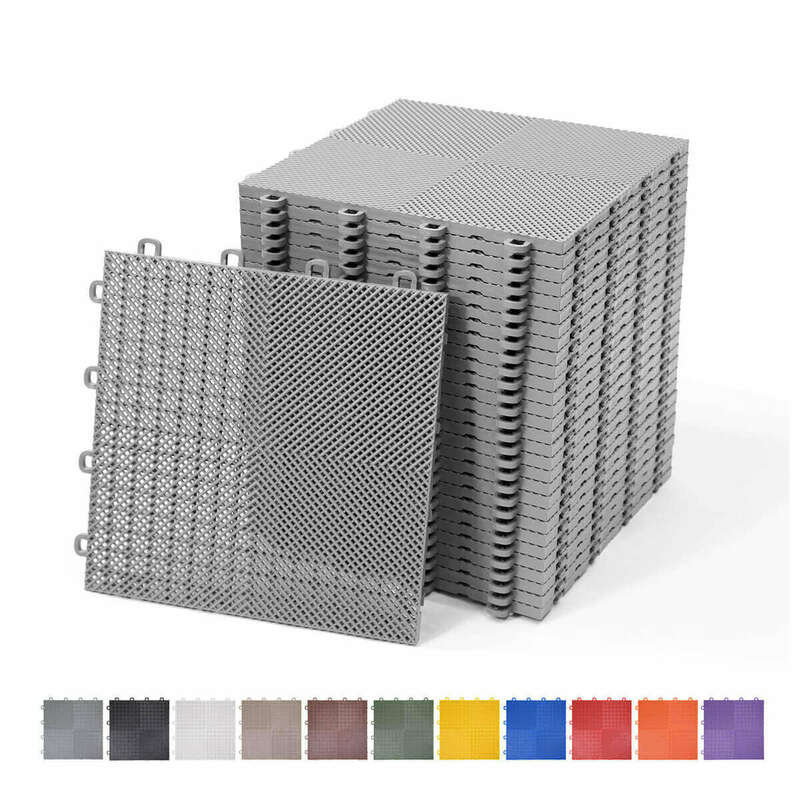 These perforated tiles use a loop-to-peg interlocking system making them very easy to install. Installation is as simple as snapping the tiles together like a children’s block set. The tiles interlock together by aligning the peg to the loop and pressing down with your fingers or a small rubber mallet. 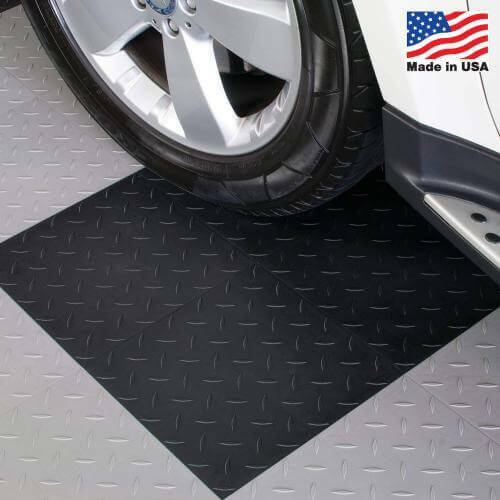 Due to differences resulting from various digital devices, please note that colors represented on your monitor may differ slightly from the actual interlocking garage floor tiles. If you are uncertain of the color or construction of the tiles, please ask for a free swatch sample to be sent to you free of charge. For questions or concerns regarding this product, please contact the Manufacturer’s Customer Service Department at 1.877.595.2040. 1 sq. ft. per tile, 30 sq. ft. Eventually I will buy more and use it on my deck, if not the entire deck, at least the walkways to keep the deck clean. Temporarily I am using it over my very light carpeting in the hallway to keep it clean. They work better than throw rugs because they stay put where you place therm. They are a little rough on bare feet but work okay with socks. They look great. Our concrete garage floor was a skating rink when wet or snowy. We were intimidated by the lengthy process and chemicals needed to etch and paint the floor with a non-slip paint, and were discouraged that the painted floor might still have hot-tire peeling after all that effort. These tiles were the perfect solution! They installed with just a rubber mallet in just a couple hours. It was super-easy and quite satisfying to just snap a floor together. The tiles are strong enough to withstand our cars and lawn tractor, not uncomfortable on bare feet (not exactly cozy, but not a problem either) and look great. So far we’ve had just rain, but not a single slippery spot. It’s easy to see that snow and slush are not going to be a problem anymore either. It’ll just melt and smush into the perforations and drain away! We did put concrete patch on areas of spalling so that the freeze-thaw cycles would not make any damage worse where we couldn’t see it. PS You don’t’ NEED the ramps on the edges. Things roll over the edge from the driveway to the tiles just fine, but I’m back on the site to order the edges because I think it will look nicer. We have an elevated rear yard deck that is constructed of subway grating to allow light to windows below. The subway grating is tough on bare feet. These 12 x 12 interlocking pavers are a perfect layer over the subway grate. They still allow significant light through, but provide a softer bare foot experience and a less industrial, more residential feeling for the deck living space. Light weight, easy to snap in (just takes some weight underfoot or a hammer). I needed something simple for a couple small patios off of the bedroom that would allow for rain to fall through and looked much cleaner than the white concrete floor which traps dirt but not too expensive. The gray is better than black to keep hot sun to a minimum but still hide dirt. Only thing is that I didn’t use all of the tiles and I have a rectangular patio so 2 edges have the loops at the ends (not a straight edge) so I covered them with some plant caddys. Turned out great for what I needed. I will buy another set for my other small patio. $3.59 $2.96 / sq. ft.